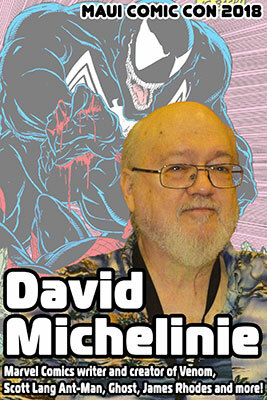 David Michelinie has been a professional writer for over 40 years. He has written more than 600 comic book stories, in which he created several characters (Venom, James RhodeyRhodes, Scott Lang, Ghost) which have been featured in major motion pictures. His comics work has spanned genres from westerns to war to horror to super hero. In addition to his comics work, David has published two novels, has placed short stories in anthologies (WEREWOLVES: DEAD MOON RISING) and periodicals (Spider-Man Magazine), and has written scripts for the Nicktoons animated series, ͞Iron Man Armored Adventures. His comic book biography of Mother Teresa won the Catholic Book Award for Best Children͛s Book, and his recent prose effort, Lord Pembertons Adjustment Service, won the 2017 Pulp Factory Award for Best Short Story. 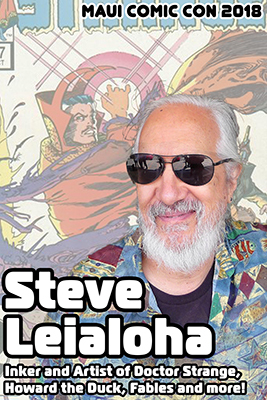 Steve Leialoha has been drawing and inking for Marvel, DC and many others. Highlights include Vertigo’s Fables, Jack of Fables, Nevada, Petrefax, the Dreaming, Sandman, and Dead Boy Detectives. Since the 70’s he has been an inker on Warlock, Howard the Duck, Daredevil, GI Joe (the Silent issue), Superman, Batman, Captain America, Captain Marvel, Ms Marvel, the Avengers, Secret Wars II, the Fantastic Four, and the original Star Wars adaptation. He has also drawn the Justice League, Dr Strange, Iron Man (the Hawaiian Adventure! ), the X-Men, New Mutants, the Hulk, She-Hulk, Spider-Man, Spider-Woman, the Hitchhiker’s Guide to the Galaxy and Star Trek! In the mid-1980s, tired of hearing publishers and editors say that girls don’t read comics and that women had never drawn comics, she co-wrote (with catherine yronwood) “Women and the Comics,” the first of what would become a series of histories of women cartoonists. She has been responsible for rediscovering previously forgotten early women cartoonists like Nell Brinkley, Tarpe Mills, Barbara Hall, and Lily Renee. 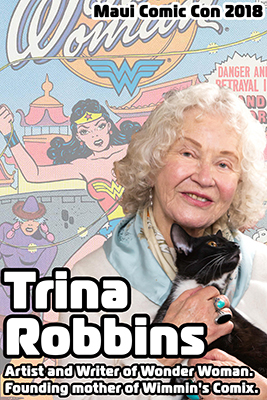 In 1986 she became the first woman to draw a Wonder Woman comic book. 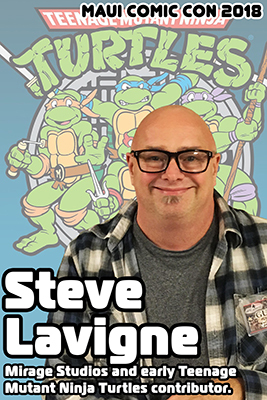 Steve Lavigne was the very first artist employee hired by Kevin Eastman & Peter Laird (co-creators of TMNT/Mirage Studios) back in 1985.He and Kevin Eastman attended high school together and it has been revealed in various interviews with Eastman, that Michelangelo’s personality is actually based on Steve. Steve began by lettering TMNT comics, coloring graphic novels and covers.He later became Licensing Artist and Licensing Art Director. Steve was the artist responsible for creating most of the officially licensed TMNT artwork seen on merchandise/toy/video game/product packaging back in the late 80’s & early 90’s. He has produced art for Playmates, Burger King, Konami, Redbook Magazine, Yes Entertainment and more. He also created TMNT characters Sergeant Bananas, Screwloose, Cuddly Cowlick, Code Name Chameleon among others. Steve continues to do covers for IDW TMNT books, tours via comic conventions and takes commissions regularly. He also owns Shellback Artworks. Shellback Artworks is a Facebook page whereby fans can view current art projects, con schedule, purchase vintage & new comics/art/memorabilia and/or request commission work. Camp was a co-founder of and director for Spümcø, the animation studio that created The Ren & Stimpy Show. He played a major role in the studio’s creative force until September 21, 1992, when he left to work for Games Productions (a.k.a. Games Animation), the animation studio Nickelodeon initially created to continue work on the The Ren and Stimpy show series after Spümcø had been fired. 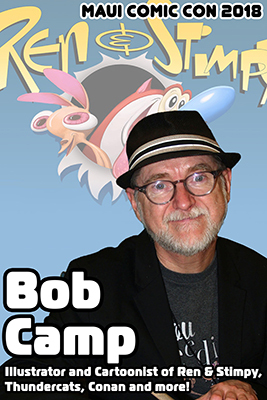 At Games, Camp was promoted to creative director of The Ren and Stimpy show and supervised work on the episodes made. After Ren and Stimpy had ended in 1995, Camp and former Ren and Stimpy writer Jim Gomez began developing a new series for Nickelodeon titled Kid Komet and Galaxy Gal, which was never picked up for a full series. In the 1980s, Camp worked at Marvel Comics as an illustrator on many comic titles including G.I. Joe, Crazy Magazine, Bizarre Adventures, Savage Tales, Conan the Barbarian, and the ‘Nam. Camp currently teaches at the School of Visual Arts. An Emmy award winning Veteran animation and comics art profession al and former Maui resident. Best known for his storyboard work for cartoon shows of the eighties and nineties like Pinky and the Brain, Animaniacs, Tiny Toons, Baby Looney Tunes, GI Joe, Transformers, Spider Man, X-Men, Transformers, Robotix, He Man, Shera, Jem and The Holograms, Conan the Adventurer, Exo Squad, Street Fighter, Duck Tails, Rescue Rangers, Tailspin, Ghostbusters, Addams Family, Sky Commanders, Garfield, Courage The Cowardly Dog, God the Devil and Bob, Pocket Dragons, Earthworm Jim, and a whole lot more. 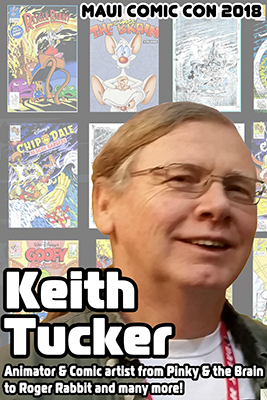 Keith’s comic book work includes several years as a cover artist for Disney comics penciling Roger Rabbit, Rescue Rangers, Goofy, Little Mermaid magazine, Disney postage stamps and more. His other comics work includes centerfolds for Tiny Toon adventures Magazine, Looney Tunes Magazine, TSR’s Agent 13, Alien Worlds, Eternity Smith, Looney Tunes comics and magazine, Apollo 13 graphic novel, the award winning George Washington Carver, Alexander Graham Bell and Apollo 13 graphic novels, and many, others. Keith’s movie credits include his time as a special effects animator for Star Trek II, the Wrath of Kahn, Conan I, and John Carpenters the Thing. Storyboards for Robo Cop III, Hideaway, Addams Family reunion, Casper, A Spirited Beginning, Casper meets Wendy, Richie Rich’s Christmas Wish, and others.